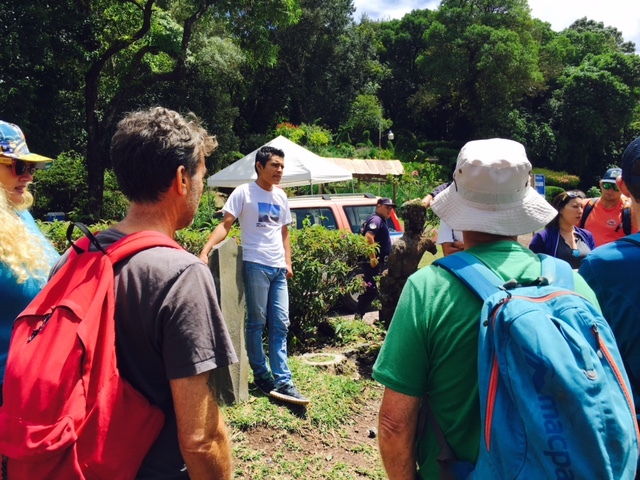 On my second day in El Salvador, Edwin brought us (me and one Chinese tourist guy who also stayed in his house) to visit volcanoes. Parque Nacional Los Volcanos, also known as Cerro Verde National Park is more than two hours drive. 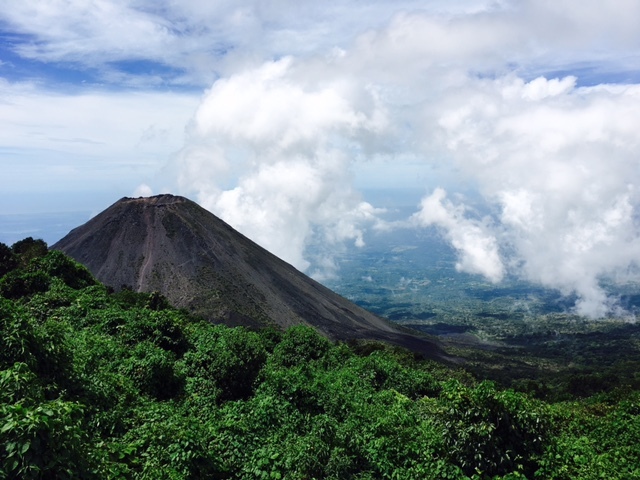 Before entering and starting the hike, we first took a glimpse of the beauty of Izalco Volcano. It got its' reputation as 'Lighthouse of the Pacific' (El Faro del Pacifico) because of it continuous eruption from 1770s to 1950s. 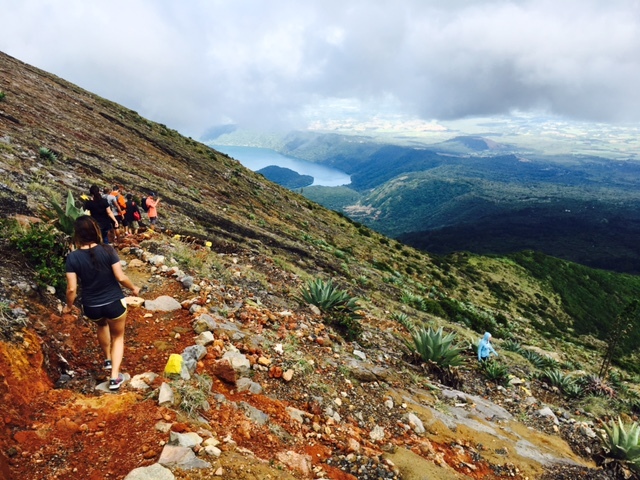 After paying the entrance fee, a local guide explained the dos and donts in hiking the Santa Ana Volcano (Ilamatepec). I understood some of what he was saying and fortunately, Edwin translated some of it for us. Basically, a local police will be with us and if it started raining, we have to cancel the hike. The way to the top was very challenging. 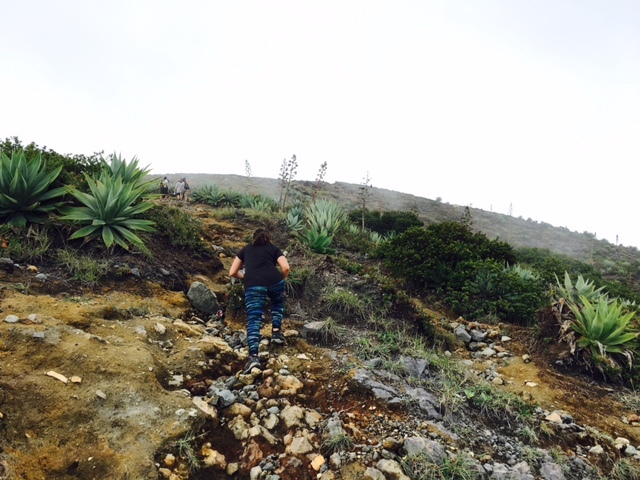 It was more than two hours of trekking with terrains that were sometimes muddy, dry, grassy and rocky. I felt my heartbeat during that time and it was so tiring. But I didn't give up and training before traveling really contributed a lot to my endurance. Once we reached the top, oh, my, gosh! It was so beautiful and all those muscle pains just suddenly vanished. There was this guy who was selling frozen banana chocolate and it helped us to recover from sweating and the heat that we felt. 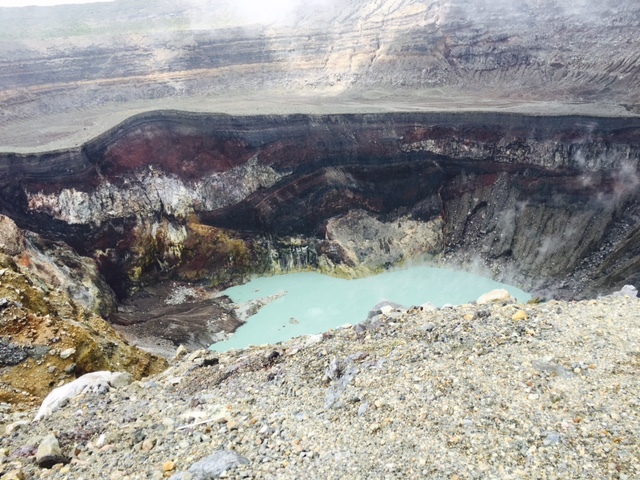 The view down the crater was so amazing! The color of the crater lake was like light green and it was almost touching the clouds. We rested there for more than an hour and took a lot of photos. It was a magnificent feat for me to reach it. It was like another an another accomplishment. The way down was easier and the view was an added bonus. I didn't even feel any legs soreness as we enjoyed every step down the hill. The highlight of the day was our late lunch! 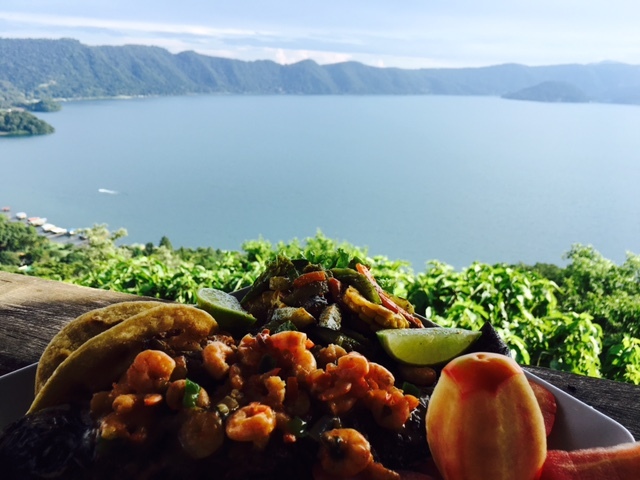 Edwin took us to this restaurant overlooking the Lago Coatepeque. It was a very refreshing view and I think the foods became so tasty because of that sight. It is one of the largest lakes in El Salvador and an hour drive from the capital San Salvador.